This one is blury but it was the only one I got before they moved. Ashes was on my right and Gabby was at my feet. When I got up to go to bed, I picked up Gabby and put her next to Ashes and this is how she got comfortable. I grabbed my phone and took a picture. I went to grab my camera, but they followed me. 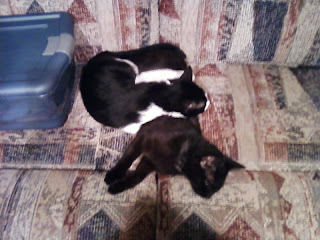 Here they are a couple of days ago on the leg rest of the love seat. Ashes was sound asleep (the purring had stopped and she was twitching every now and then from her dreams). Gabby came in and made herself comfortable. Over the weekend, I ran some errands. When I got home, this is how I found them.